Tread in the footsteps of the legendary Fafhrd and the Gray Mouser! 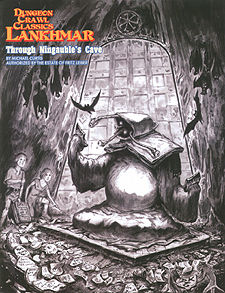 Through Ningauble's Cave is the first release in the Dungeon Crawl Classics line of Lankhmar supplements. As we build toward a large boxed set, this "first-look" sourcebook provides DCC RPG judges with all the information needed to journey to the world of Nehwon, home to Lankhmar, the fabled City of the Black Toga. Through Ningauble's Gate details the secrets of Ningauble of the Seven Eyes. It includes rules for using him as a patron, as well as information on his fantastic cave that touches multiple worlds. With the material in this book, your players can journey to Nehwon... or have Nehwon come to your campaign world! Look for future releases further exploring the tales of Fafhrd and the Gray Mouser, the creations of world-renowned author Fritz Leiber, and eventually a complete boxed set.